To the Honourable the Court of Directors of the United Company of Merchants of England, Trading to the East Indies, This Representation of the Engagement, between their Ships Suffolk, Houghton and Godolphin, and Two French Ships of War; onthe 9th day of March 1757. Is Inscribed by their Most Obedient, Humble Servant, Rob.t Willock. Design'd & Painted by R Paton. Engrav'd by P.C. Canot. London 15.th April 1758, Publish'd According to Act of Parliament, To be had of R. Paton in Wardour Street, Soho, & R. Willock in Cornhill. Engraving. Sheet: 380 x 515mm (15 x 20¼''). Trimmed within plate. Few minor repairs. 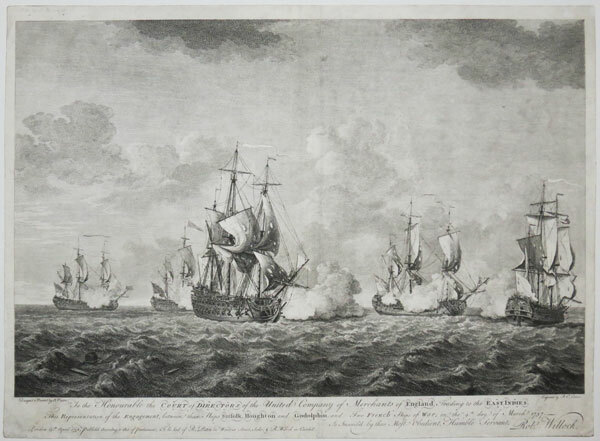 A battle scene showing three East Indiamen engaging with two French ships off the Cape of Good Hope on 9th March 1757. Three homeward bound East Indiamen, the ‘Suffolk’, ‘Houghton’ and ‘Godolphin’ were intercepted by two French privateers off the Cape of Good Hope. The merchantmen were heavily laden and represented great riches for the French privateers. However they were unable to capture them when the Indiamen formed a line and beat them off after a three hour engagement. James Northcote pinx.t. T. Gaugain fecit. Rare stipple engraving. Sheet 525 x 650mm (20¾ x 25½"). Trimmed within plate and laid on archival paper; top right corner reinstated to image, with small tear repaired; small area of loss in English title. 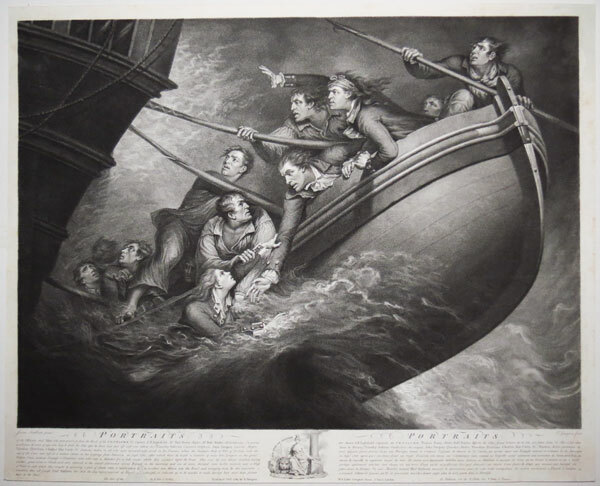 A dramatic naval scene showing the twelve members of the crew of HMS Centaur taking to one of the ship's pinnaces and attempting to push away from their ship as it founders. HMS Centaur, a French frigate captured during the Battle of Lagos in 1759, was one of a fleet escorting prizes from the Battle of the Saintes back to Britain from Jamaica when the 1782 Central Atlantic hurricane hit off Newfoundland. Captain J.N. Inglefield and eleven crewmen reached the island of Faial in the Azores after more than sixteen days in an open boat. It is believed that 3,500 lives were lost from the various ships of the fleet. The painting, now lost, was exhibited at the Royal Academyin 1784. Fine hand-coloured lithograph. Sheet: 240 x 350mm (9½ x 13¾''). Staining. 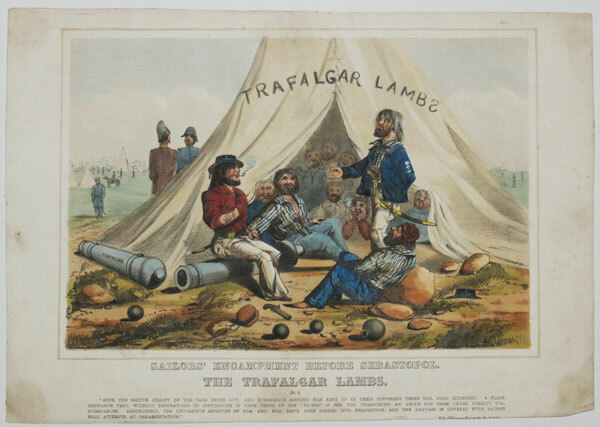 A scene showing sailors from the HMS Trafalgar sitting singing and telling stories in front of a tent during the Crimean War.